Beaconsfield relief road plan: The northern section starts at a new roundabout at Maxwell Road and joins the southern section at Minerva Way. On Monday 4th June 2018 preliminary work started on the northern section of the new Beaconsfield relief road. The relief road will run from a new roundabout at Maxwell Road to link with a southern section being built by developer Inland Homes from Pyebush Roundabout on the A40 to Minerva Way on the emerging Wilton Park housing estate. The project is due for completion in summer 2019. The new stretch of A355 will relieve congestion at London End roundabout and provide a more direct link for traffic bound for the M40 and Slough. Contractor Balfour Beatty has been commissioned to check the land for any archaeological evidence before construction work starts in July 2018. Only when artefacts have been recovered and logged can construction on the half mile (940 metres) northern section of the road start. The relief road improvement project is one of Buckinghamshire County Council’s high priority schemes, with a £9.2 million budget, funded by £3.1m from the Local Transport Board (LTB) and by a £6.05m grant from the Government’s Local Growth Fund through Buckinghamshire Thames Valley Local Enterprise Partnership (BTVLEP). 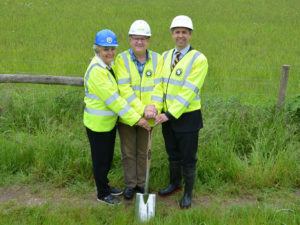 Turf cutting for the Beaconsfield Relief Road: Deputy Leader and Transport Cabinet Member Mark Shaw (centre) with BTVLEP Programme Manager John Rippon and Anita Cranmer, Beaconsfield Town Mayor and local county councillor. Mark Shaw, Deputy Leader and Transport Cabinet Member at Buckinghamshire County Council, said the plans had been scrutinised by community groups and other local stakeholders at an options workshop in 2016 from which feedback had helped shape the final scheme. 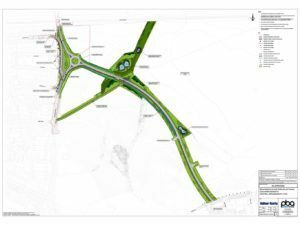 Richard Harrington, BTVLEP Chief Executive, said: ‘We are delighted to see this BTVLEP supported road scheme commence, which aims to improve the resilience and performance of Buckinghamshire’s local highway network, and enhance strategic north/south connectivity for the county.